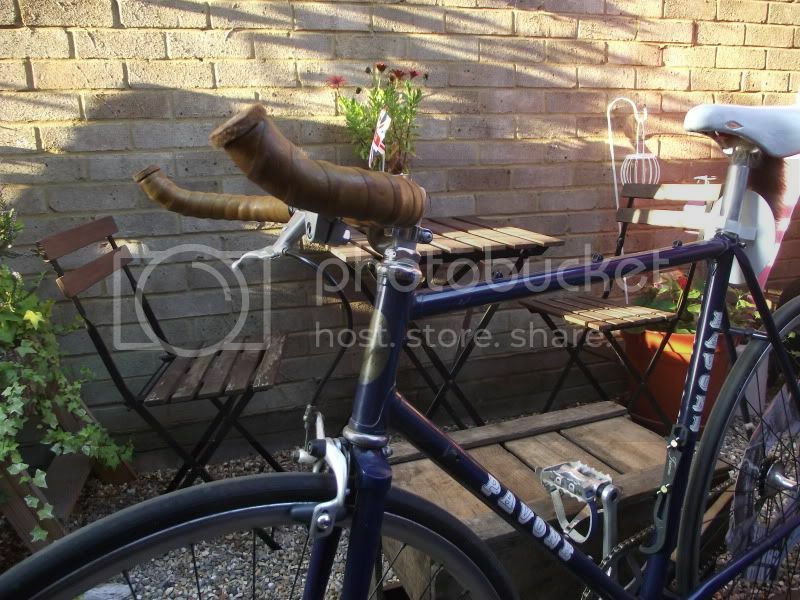 My recent 'find out' which maker rebuild road bike. PAVONE. Photobucket did the job. Here you go mate. I should have wiped the decals before I took the pic, there's a fly on the 'P' in the second pic. They are all in pretty good nick. Thanks for doing the ground work for the frame though, it has a story now! Finally another Pavone has come to the light of the retro crew. 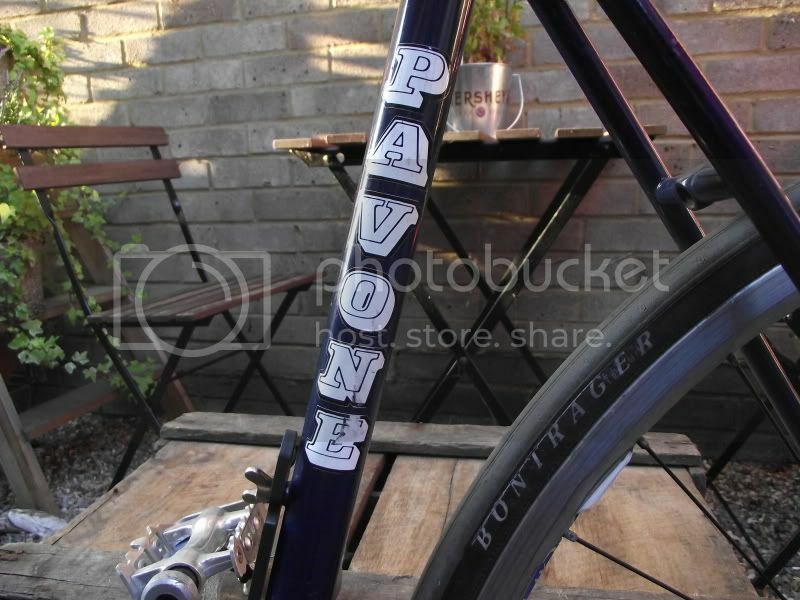 I did think of doing the Pavone decals two dimensional because you can see it in the bare steel. I didn't expect to see the pavone letters in white! Was told they were in chrome gold, but could have been different on other bikes. 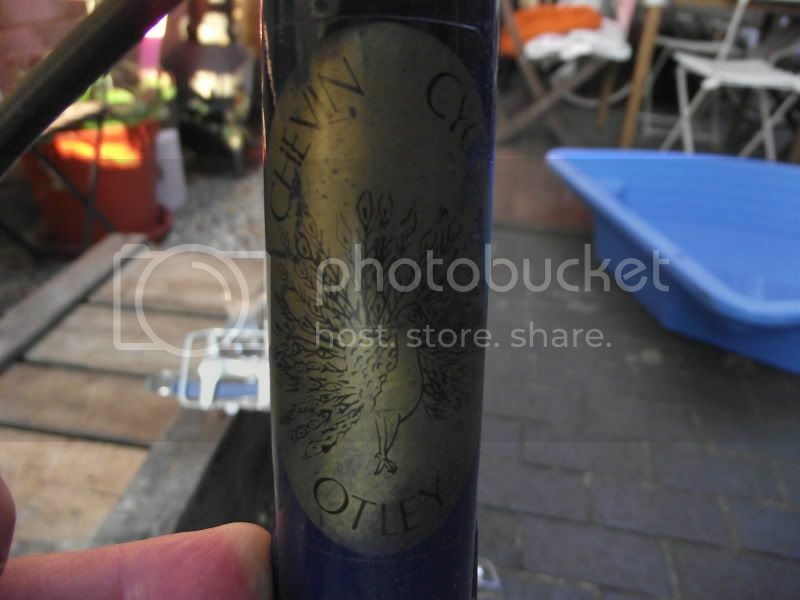 On the bottom of my head badge i was to put Otley but thought it may be too much but now i've seen your head badge i may find it out and stick it on. Thanks for taking the time in uploading the pic's. If you want any hi-res pics of the decals or head badge just let me know. and do replacement decals in white and chrome gold. - bung some other forks on, but then the match of the current ones is good. Anyway, the only reason I know it was branded Pavone is that in certain lights you can see the shadow of the lettering on the now bare paintwork. If anyone does get any more on the brand/heritage, I'd be interested to hear it. the only reason I know it was branded Pavone is that in certain lights you can see the shadow of the lettering on the now bare paintwork. at Chevin cycles they was custom built[groupsets] to customers requirements, many racing bikes where custom made for a local Yorkshire amateur racing team. Peter Harrison has told me the Pavone is worth its weight in gold as they where only made for a couple of years and are very rare to find, especially the 753 versions which was used for the 'team'! The 'team' (to the best of my knowledge) was probably Halifax RC which was not 'officially' sponsored by Pavone/Peacock's but riders were 'encouraged' to either ride a genuine Pavone or to have their existing frames re-enamelled and Pavone transfers fitted. Danny Horton was probably the most well known of the HRC members and rode Pavone to many wins and championship placings. This was when Peacocks had a shop in Halifax. 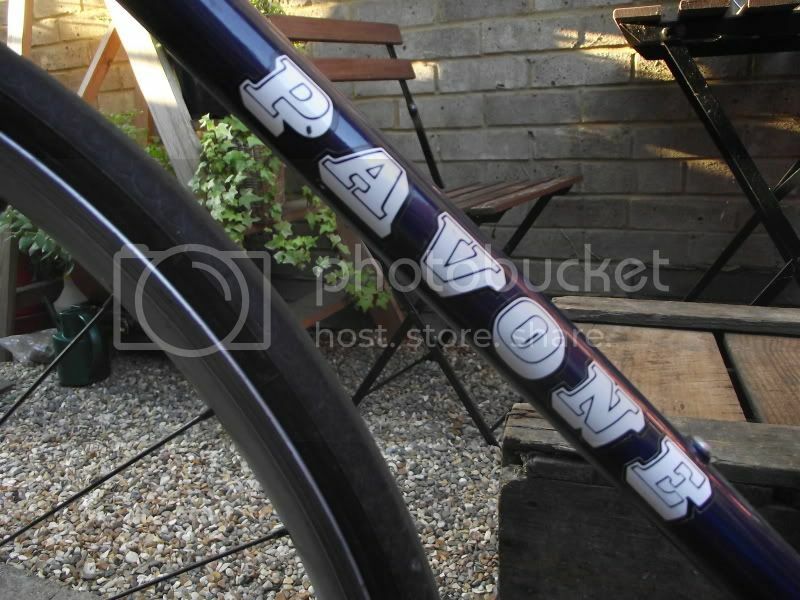 I can't remember Pavone having any involvement with professional teams but it is always possible that one team did ride Pavone frames at some time. If anyone knows of this then please tell! Halifax RC was in some ways a pure racing offshoot of Halifax Imperial Wheelers and some members transferred across. I worked with John Peacock at the shop in Halifax at the time the Pavone logo, frames and shirts were designed. As well as in the shop in Sowerby Bridge, with Spen the father of all the brothers. I remember assembling the green and gold Pavone on display in the shop window, with John. John was a master technician and could true a wheel better than anyone I knew. The shop was called Cyril Sands Cycle Centre. The white logo in the pictures were used in Halifax, I think the ones in gold were used in Otley, which was owned and run by Rick, john brother. Bob and Steve still run cycle gear in Halifax. It was a fun time and I am a better person today having known them all and the rest of the family.